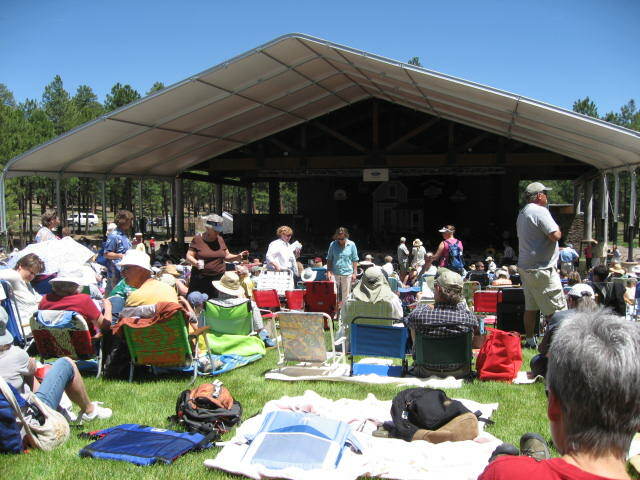 For my husband’s birthday, I bought tickets to attend a live taping of Garrison Keillor in Flagstaff yesterday. We had lunch with a girlfriend of mine from college first, then met up with some Prescott friends at the concert. It was sunny and warm, with a nice breeze wafting through the pines, and a happy crowd. Now, I’m not a major fan, but having lived in Flagstaff for years, it was fun listening to the good-natured ribbing given it in the show. Afterwards, we headed to Williams to have a bite to eat on the patio of an Irish/Mexican restaurant on Main Street West. The rather expensive food was pretty good, the beer was kinda warm, the service was slow, the singer was definitely middle-of-the-road, yet fun…but overall we had a pleasant experience. 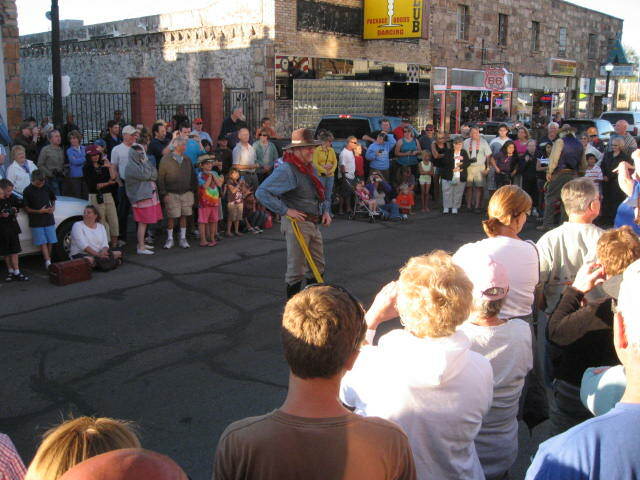 We walked back to the car, and what to our surprise – they had actually shut down Route 66 RIGHT AT THAT MOMENT for a shootout reenactment! I mean, there were people leaning on my car! We realized that we were literally seconds too late to do anything about it…so we climbed up on the car and took some pictures. It was a sweet little melodramatic experience, and afterwards, while people were having their pictures taken with the actors, we had an opportunity to walk around a bit more and get an ice cream cone…the quintessential summer treat! So, the moral of the story is, if you get stuck somewhere, why not just relax, enjoy it, and make your own little slice of paradise? For more Postcards from Paradise, visit http://www.corazon.typepad.com/. ~ by Dawn Elliott on June 5, 2011. I actually adore Garrison Keillor. Cat Sailing days is one of my all time favorites of his and their are many others. He just tickles me. Love the shoot out. I agree, take it as it comes and eat Ice Cream!! Good idea. I so much wanted to see this show. Alas, I am thousands of miles away from Flag right now, but so glad you and your beloved got to go! i secretly wished all month my husband would take me for my birthday! honestly, we have listened to the charm of prairie home company for countless years. i of course did not rely on said husband reading my mind….i waxed euphoric on the fact that garrison keillor would be in flagstaff!!! well…that’s the news from lake woebegone, my home town!!! glad you gave such delight to steve! somehow that seems so fitting…Garrison Keillor just makes you slow down and take it as it comes. What a great weekend!